Reference request: autopoiesis and hurricanes, fire etc. I’m wondering if the readers of this blog can help me out with a reference request. I’m currently putting together a paper about the relationship between autopoiesis and dissipative structures, which is partly following on from conversations that took place on the pages of this blog several years ago. The point is that structures like hurricanes have many of the properties of an autopoietic system – they consist of a network of processes that maintain the system as a unity distinct from its environment, albeit with a blurry boundary – and that this has both practical and philosophical implications that we should pay attention to, especially if we’re enactivists who are interested in the origin of life. My question is whether the issue of hurricanes (and/or related dissipative structures such as fire) has been directly addressed in previous literature. I’ve been having these discussions with people for years, and I don’t think the idea was exactly new when I started, so I’m interested in tracing its history. Is there anything in the work of Maturana and Varela or their contemporaries that directly addresses this issue? Or is there anything substantial that has been written about it more recently? If so it would be very valuable to know about it, so that I can cite it in my paper. I would be particularly happy to find an explicit argument that hurricanes (or other dissipative structures) should not be considered as falling within the framework of autopoiesis, or the enactive paradigm more broadly. It’s been years in the making, now it’s a real thing (I and others can confirm its concrete worldly existence). 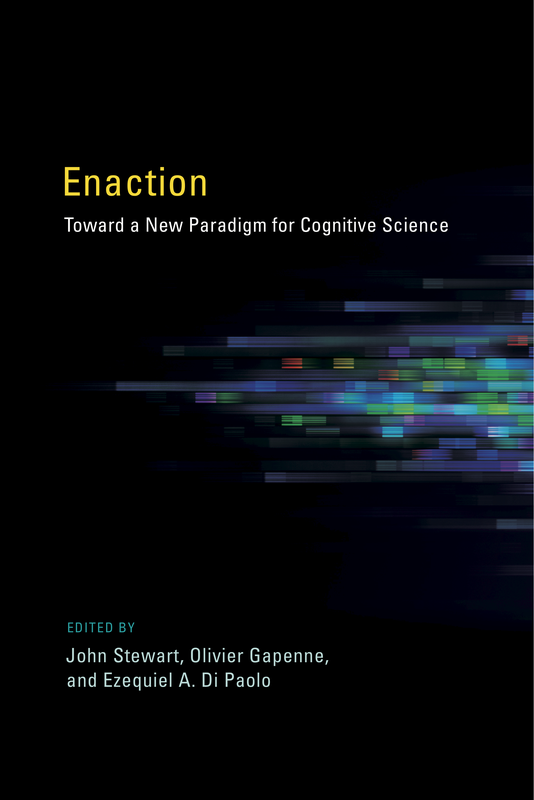 The new book on Enaction: Toward a New Paradigm for Cognitive Science, edited by John Stewart, Olivier Gapenne and Ezequiel Di Paolo, and published by MIT Press has finally come out. “This book presents the framework for a new, comprehensive approach to cognitive science. The proposed paradigm, enaction, offers an alternative to cognitive science’s classical, first-generation Computational Theory of Mind (CTM). Enaction, first articulated by Varela, Thompson, and Rosch in The Embodied Mind (MIT Press, 1991), breaks from CTM’s formalisms of information processing and symbolic representations to view cognition as grounded in the sensorimotor dynamics of the interactions between a living organism and its environment. A living organism enacts the world it lives in; its embodied action in the world constitutes its perception and thereby grounds its cognition. Enaction offers a range of perspectives on this exciting new approach to embodied cognitive science. Some chapters offer manifestos for the enaction paradigm; others address specific areas of research, including artificial intelligence, developmental psychology, neuroscience, language, phenomenology, and culture and cognition. Three themes emerge as testimony to the originality and specificity of enaction as a paradigm: the relation between first-person lived experience and third-person natural science; the ambition to provide an encompassing framework applicable at levels from the cell to society; and the difficulties of reflexivity. Taken together, the chapters offer nothing less than the framework for a far-reaching renewal of cognitive science. At the Life & Mind Seminar on Tuesday we very briefly discussed the importance of a spatial (physical) boundary in the context of autopoietic systems. I am interested in this topic, so here is my attempt to rekindle a discussion of it. Here is my view on the importance of a spatial boundary in autopoietic systems. Much of the conversation on Tuesday focused on the idea of `boundary’ in the context of autopoiesis. There are two boundaries with which we are concerned: the spatial (yesterday often refered to as `the physical’) and the organisational. A spatial boundary is a delimitation of a contiguous region of space. Examples of spatial boundaries include a soap bubble, a cardboard box and a cell membrane. An organisational boundary is less easily visualized. It is a delimitation of a set of influential factors. From all of the influential factors involved in a car moving down a road, we can select a certain subset of factors – say those factors that keep the car on the road. However, the organizational boundary from autopoietic theory is a more restrictive concept than just a selection of influential factors. Unlike the selection described above, an autopoietic organizational boundary delimits a contiguous set of enabling processes. If we consider figure 1, this may become clear. Figure 1: Two types of boundary. End points of arrows represent processes while the arrows themselves represent `enable’.